This is the ninth report from Democratic Dialogue, the Belfast-based think tank. DD gratefully acknowledges the generous support of its funder for this project, the EU Special Support Programme for Peace and Reconciliation in Northern Ireland, via the Community Relations Council. Further copies are available from the address on the inside front cover, price £7.50 (£10 institutions, £4.50 unwaged) plus 10 per cent postage and packing. DD publishes a number of reports and discussion papers per year. Readers may wish to return the enclosed subscription slip, to avail of reduced-rate payment for reports, reception of all papers and notification of all DD events. DD is keen to facilitate debates or discussion groups around any of the themes or ideas raised in this, or indeed other, reports. Again, the contact number is on the inside cover, where details of our web site can also be found. The Belfast agreement is a very complex document which many have found difficult to understand. Many more have been unsure which 'side' has 'won' - who has emerged uppermost out of the pit of three violent decades. The best way to understand the agreement, and to appreciate its political potential, is to place it in its international context. The themes within it - self-determination, territorial claims, human and minority rights, and so on - are the very issues which the international community has had to grapple with across a wider European canvass since the Berlin Wall came down in 1989. And the way these themes are addressed, far from reflecting a partisan approach, chimes with the emergent norms of the new international order. of opinion from non- and inter-governmental organisations across the continent, exploring the architecture required to guarantee security and human rights in the 1990s. The agreement (pace Sinn Féin) is in line with the principles of self-determination as they affect contested areas, where it is widely accepted that the future of such areas should be decided by a majority in a plebiscite within them - even though, as a procedure, that is not without its problems. The quid pro quo in such situations is that the minority forced to inhabit a state not of its choosing should be entitled to a raft of balancing rights. Such rights are not (pace Robert McCartney) restricted to the abstract rights of individuals, as represented by the European Convention on Human Rights, but do include the particular rights of members of communities. Hence it is legitimate that the agreement promises a specific Northern Ireland bill of rights which will include not only the ECHR but also rights concerning 'parity of esteem'. It is significant in this regard that the UK has just incorporated the Council of Europe framework convention on minority rights and the Irish government is enjoined by the agreement to do likewise. It is also noteworthy that the provisions on the Irish language are legitimated by reference to the council's charter on regional and minority languages. It is also the case that in areas inhabited by more than one community which require to co-exist, there have to be arrangements to ensure one community can not dominate the other. The weighted majority/parallel consent provisions are thus in line with, for example, Belgium where 50:50 government operates between Flemings and Walloons rather than majority rule. It is further accepted that while secession from existing states (and a consequent decision to join another state) can indeed take place, that can only be where the decision is democratically validated and there is no question of coercion. Territorial claims have in that sense been illegitimate in international law ever since the Helsinki Final Act of 1975. The proposed reform of articles 2 and 3 would definitively remove the republic's claim to the north. However, if it is true that the inviolability of borders to forceful change is recoguised, it is also recognised that borders are nowadays much 'softer'-more permeable-than before, as developments like European integration have undermined barriers to free movement and exchange. The north-south provisions in the agreement are in line with several similar arrangements between EU regions! states, through which competencies held by regional/national administrations are shared on a basis of mutual accountability to their assemblies/parliaments. Even modest practical collaboration can have beneficial results in building trust and a sense of commitment to joint goals from which all can benefit. This applies as much to the work of the North-South Ministerial Council-even though its domains will be initially modest-as to the Assembly. International human rights conventions provide a standard against which continuing communal arguments can be assessed. The new Human Rights Commission will have an important role in promoting understanding of rights, and concomitant responsibilities, in the wider society. Support for cultural creativity is crucial to allow new, overlapping and multiple identities to emerge and be expressed, rendering unthinking communal identification less compelling. With 12 members in the Assembly Executive Committee, a minister of culture should certainly be designated. Transcendent symbolism will be needed to ensure that communal symbols do not monopolise the public domain. The power, for example, of a public handshake between political leaders across the divide should not be underestimated. Non-governmental organisations committed to reconciliation are an important counterweight to communal polarisation. The agreement recognises the contribution they have made but resources will have to follow if this task is to be sustained - especially after the 'peace package' expires. The constructive forces within civil society need an outlet to engage in a positive dialogue with elected policy-makers. The Civic Forum should be a vibrant voice for that society, not muzzled by the politicians. As the new millennium approaches, the euphoria across Europe which accompanied the fall of the Wall in 1989 seems a distant memory. While the war in ex-Yugoslavia has thankfully abated, at the time of writing the Kosovo tinderbox threatened to ignite another Balkan conflict. As the proliferation of micro-nationalisms has demonstrated in zones of ethnic and nationalist tension, the message seems mostly to be the same: such peace as exists is largely premised on separate, rather than shared, existence. This is neither liberal nor democratic, though for the most part it is manageable. But must such outcomes - complete with their proliferating borders and walls - represent the summit of civilised aspiration, at the conclusion of the century which eventually saw liberal democracy enshrined as the ideal form of government for all? Must 'progress' now be history? In Northern Ireland, the two main religious communities live more segregated lives than ever. Yet in the Belfast agreement of April this year, the subscribing Northern Ireland parties and the London and Dublin governments set very high ambitions. For the document boldly envisages undoing 50 years of one-party rule at Stormont, three-quarters of a century of cold war between north and south in Ireland, and an end to the bloc division which has been a defining feature of Irish politics ever since the failure of the United Irishmen 200 years ago. These are grand ideals. Whether in terms of political power-sharing in the Executive Committee of the Assembly, the economic and social work of the proposed Civic Forum, all-Ireland co-operation in the North-South Ministerial council, or the aspiration for more integrated education and mixed housing, the agreement can only function if a genuine civil society is constructed in Northern Ireland, situating itself in the wider variable geometry of these islands which the accord sketches out. It will, self-evidently, need all the help it can get. And, in getting its collective head around these daunting challenges, there are two obvious external sources to draw upon. The first is the domain of non-governmental organisations (NGOs). Across Europe - indeed they often have a transnational reach-NGOs at best embody values of liberalism and democracy, unsullied by more Machiavallian considerations to which governments are prone, which are indispensable ingredients of a civil society. They also have deep concrete experience to bring to bear of the struggle to maintain such civilities in the face of centrifugal forces of conflict. The second is the sphere of inter-governmental organisations (IGOs): the United Nations, the Organisation for Security and Co-operation in Europe, the North Atlantic Treaty Organisation, the Council of Europe and the European Commission. In the post-cold-war era, the international community has had to cope in general with much more unpredictable threats to security, notably with the rise of nationalist claims which can all too easily erupt into the horrors of 'ethnic cleansing'. In particular, it has had to wrestle with how to enshrine the rights of those minorities trapped by history on the 'wrong' side of borders and neglected by majoritarian - even, in these terms, democratic - régimes. Moreover, NGOs and IGOs increasingly co-operate one with another in these endeavours. 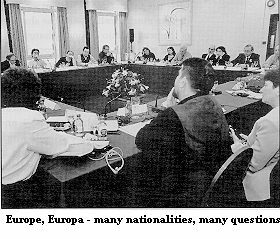 It was with this rich vein of experience in mind that Democratic Dialogue brought 35 people from 17 countries - from Yerevan to New York - to the Europa Hotel in Belfast for three days of intensive discussion of the shape of a new European order capable of offering security and human rights to all. A creative chemistry was quickly established between representatives of NGOs and IGOs, and domestic and international experts. The round-table not only took place in an appropriately named venue but it opened exactly two weeks before the closure of the negotiations on the Northern Ireland agreement: viewed from the conference suite on the top floor of the hotel, Belfast thus provided not just the physical but also the political backdrop to the discussions. At the time, amidst near-daily mood swings, no one knew whether we were facing into a new era or would be condemned once again to live out an old one. But while we now know that a shaft of light has been shone on the future, the task of reconciliation emerges in even starker relief - and the shadows of the past remain behind to haunt us. All who took part in the round-table spoke glowingly about the insights they had gleaned from it. Fundamentally, these were insights into how to resolve ethno-nationalist conflicts in liberal-democratic ways, which preserve and strengthen civil society-insights which will be highly relevant as we attempt in the coming months and years to build peace in Northern Ireland. Acting as note-taker throughout the event-kindly and ably chaired by Quintin Oliver throughout - my job was to distil these ideas from the discussions. And many there were, of value both to NGOs and to policy-makers. 1) Conflicts may be about both national identities, on which compromise is required, and inequality/oppression, on which surely compromise is unacceptable. Can identity politics and equality be reconciled? 2) Individuals may be at a disadvantage as members of minorities rather than as individuals, yet installing group rights may institutionalise division. Can individual and collective rights be reconciled? 3) The 'pull' of conflicting nationalisms (including, in Northern Ireland, unionism) has proved much stronger than other 'isms', yet without a common domain civilised life becomes impossible. Can pluralism and common life be reconciled? 4) 'Thin' transnational connections may be too little for minorities trapped on the wrong side of borders, yet 'thick' territorial claims may be too much for majorities. Can self-determination and sovereignty be reconciled? 5) Issues such as these are often discussed with great sophistication amongst NGOs, yet in formal politics much more conservative thinking usually prevails. Can 'small p' NGOs really shape the 'big p' political agenda? Each theme was opened with a paper from an expert in the field, and in each case a representative of one of the IGOs was asked to begin the discussion. In each case, the debate moved towards practical proposals at the end. This publication includes the papers and an account of the suggestions which emerged. The opening and closing sessions of the event sought to draw the five themes together. The excellent keynote address by the former senior UN official - originally from Northern Ireland - Cedric Thornberry and the overall conclusions from the event thus begin and end this DD report. 3 The programme is in appendix 1. 4 The participants are listed in appendix 2.